If attacked, or in danger, the Octopus can release a dark ink from its ink sac to obscure it's flight to safety from the danger. Picture Location of this colourful Octopus picture is off the coast of St. Thomas Island. Additional information about the Octopus picture: The Octopus or "devilfish," is a predatory mollusc with eight tentacles, each one having double rows of suckers. Siteseen Ltd. are the sole copyright holders of this Octopus Tropical Marine Fish picture, unless otherwise stated. We only authorise non-commercial picture use and particularly encourage their use for educational purposes. 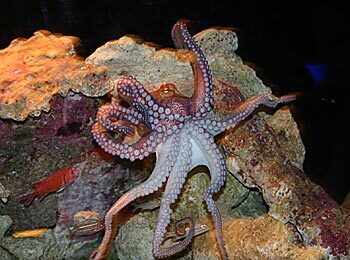 This Octopus Tropical Marine Fish picture is not in the Public Domain. 3) Use of this Octopus Tropical Marine Fish picture, or any of our pictures on websites re-distributing copyright free material is strictly prohibited.